Staples Center hasn't exactly been home sweet home for the LA Kings this postseason, as they went just 2-4 in the first two rounds of these playoffs. But you'd never guess it from watching the last two games at Staples vs the Blackhawks. The Kings beat the 'Hawks 5-2 in Game 4, their third-straight win in the series, to take a commanding 3-1 series lead over the defending champs. LA scored three times in the first period, blowing the game wide-open and leaving the Blackhawks with the task of climbing out of a possible-series-killing-hole while still in the opening 20 minutes. 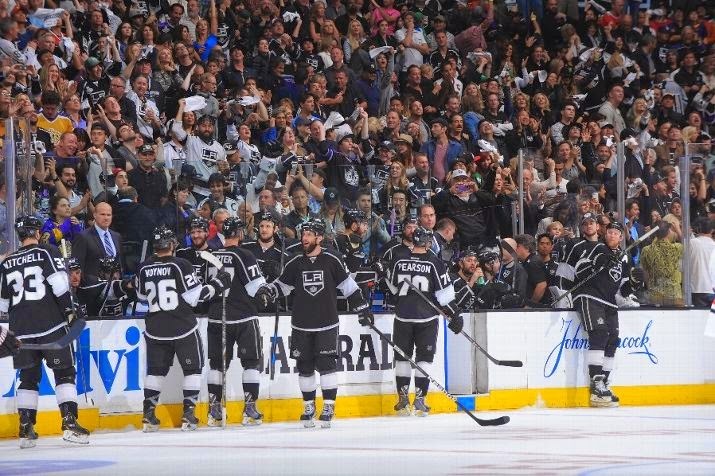 Jake Muzzin, Anze Kopitar, Dustin Brown, Drew Doughty and Tanner Pearson all scored for the Kings. Jonathan Quick made 22 saves for the win. Brendan Saad and Bryan Bickell scored the two goals for Chicago. Corey Crawford leaked four goals while facing just 20 shots in total. Game 5 will be played tomorrow in Chicago, with the Blackhawks facing elimination, and the Kings staring at a return trip to the Stanley Cup Final for the second time in three years after they won the Cup in 2012 over the New Jersey Devils.